Welcome to Country Living and Farm Lifestyles' fourth e-zine. Well, it's Thanksgiving time again, and Christmas is just around the corner. Who would have thought that the year would have gone so quickly? Time passes so fleetingly that it really is a special occasion where we are lucky to have the opportunity to spend quality time with friends and family, as you never know what the New Year will bring. I would like to take this time to wish our American cousins a very happy Thanksgiving on the 27th of this month, and of course to everyone - a very happy and blessed Christmas. We have some delicious new recipes for you to try for these special occasions and a section on wreath making to decorate the doors of your homes. WHAT'S NEW SINCE OUR LAST ISSUE WENT OUT? * Best Recipes. Since opening up this section we have had several submissions by our readers of their best recipes. However, we would love to see all of you making a contribution in this section. We also have some special starters and soups for Christmas day which can be found in the link below. * Thanksgiving and Christmas Recipes - This page is still under construction and will be finished in the next day or two, so check back often to see where we have got to. * Italian Recipes - This is another new section that is under construction. I love Italian food, as many of you probably do too, so we hope you will try and enjoy the recipes as we put them out. * Decorating Ideas - Here you can find out how to make new cushion covers for your home in no time at all, along with learning the technique of destressing a piece of painted furniture to give it that old cottage look. * Country Living Bookstore - Our new bookstore has books, magazines and DVDs to purchase for organic farming, country crafts like soap making, candle making and cheese making, and much more. With Christmas just around the corner why not give books as gifts? There is plenty to choose from. * Country Life Forum - This is an external forum that has been created for you, our readers, if you would like to come an introduce yourselves and discuss anything you like. We have over 60 subscribers, and we would love to know more about you. * Country Picnics - If you are thinking about taking more picnics when summer comes around, then now is the time to look for ideas on what to eat and pack Our section on picnics has everything you will need to have a successful picnic. * Show us your Farms - This is one of several new sections in the Farm Forum where you can make submissions. This section allows you to show off your farm and do a little bragging. We would love to see who you are, and what you do. Still waiting for those first photos to come in. Who will be the brave first? Come on, don't be shy! * Wild Chickens, a Shotgun and Some Aluminium Cans - This is a humorous story that was submitted by one of readers in the USA. He was kind enough to submit a second, which was just as funny, this time about a cat. Both of these stories can be found under the Farming Stories section. Thinking about keeping a pet pig? Then this article may be of interest. Read the full article on keeping pet pigs. Are you interested in Learning more about the Amish? We don't normally have a second article, but this one gives you some insight into the Amish and answers questions you may have had, and now will have the answers to. The farmlands of the Pennsylvania Dutch Country are among the most productive in the nation. But many of the farmers there are different from most Americans; different by choice. For these are the Old Order Amish and Mennonites, also known as the "Plain People". Read the full article on Amish Communities. 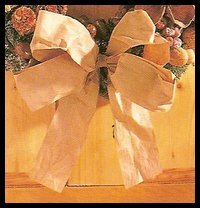 I promised you a country Christmas, and hopefully you will be inspired to create some of these wonderful Christmas wreaths for your front doors. 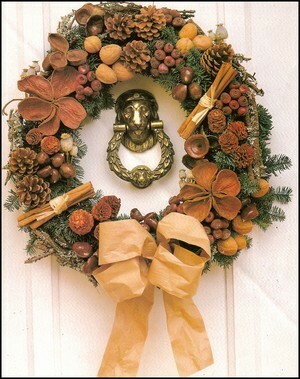 Using natural ingredients with rustic textures and colours will result in a superb seasonal wreath. However, if you are after something less rustic, and more sophisticated by looking at the examples below and following the basic instructions, you can create any type of Christmas wreath. A bag of florist's moss, or hay/straw. 3 large round seed pods or conkers, etc. Six bunches of real or artificial berries, rose hips, etc. Step 1: Make a ring about 30 cm in diameter, using strong wire. Bind the ends together with florists' wire. 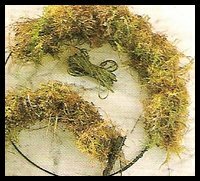 Attach handfuls of moss, or hay to the ring by binding with the thicker florists' wire or garden string, until completely covered. Step Two: Cut off sprigs of blue pine and separate them into 3 groups. Bind the ends together with the thinner wire to form sprays, leaving a length of wire on each. You will need 20 similar sized bunches. Working around the outside of the ring in one direction, add the larger bunches of pine by pushing the wire through the moss and attaching it securely by bending the wire back on itself. Fill the inside of the ring with smaller sprigs. 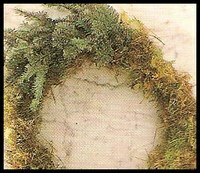 When the moss is completely covered, bind some thin wire around the wreath to pull in the ends of pine and make an even round shape. 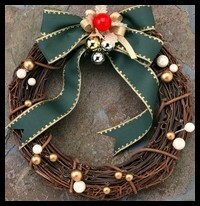 Make a hanging loop with strong wire and attach it to the wreath. Step Three: Wire your decorations. For the fir and pine cones, press thick wire in between the petals and twist back on itself to make it strong. 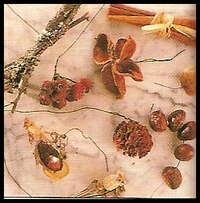 Chestnuts: make a hole with a compass, or skewer through the chestnut and use stub wire to bind four or five together in a bunch. Walnuts: Push a piece of thick wire with a dab of strong glue into the base of the walnut where a hole already exists. Seed pods: Whatever seed pods you are using, make a hole through these with a compass point and thread your wire through to secure. Poppy heads: Bind together in small bunches and wire, or tie together. 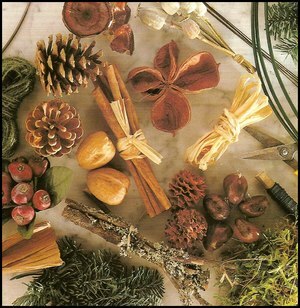 Lichen twigs and Cinnamon sticks: Bind together with raffia. Artificial or fresh berries: Tie together with wire. Step Four: Hang the wreath and begin to match the decorations to it. 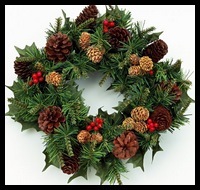 Remember that the wreath will be seen from the front and side, so you will need to cover it evenly all over. Start by attaching the larger decorative items. Push each end of wire through the moss and tie it around securely. You can use a knitting needle or a kitchen skewer to force a hole through the moss. Fill in the smaller areas with single cones, chestnuts, and walnuts. Build colour contrasts using the various items. Don't work symmetrically, but try to create a balance on both sides. Leave a space for your bow at the bottom. Step 5: Make a bow and attach to the wreath using the thinner wire. This can either be a paper bow, a ribbon bow or a raffia bow. Glue a small panel of material around the middle to cover the wire. And here is the final product. If you are not crazy about this design look at some others we have here for you to try. For those of you who are looking for decorating ideas regarding the elements of what constitutes "Country Decor" Follow this link: Country Decor which takes you to some wonderful books on the subject, among others. 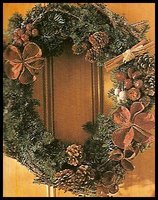 Well, here is a recipe that goes with our Christmas Wreath theme - it's a Festive Stuffing Wreath for your dinner table. Simply cut into slices to serve and don't forget to remove the cocktail sticks for the children. 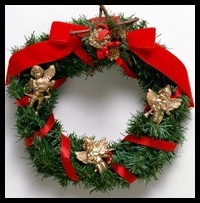 Method: To make the wreath, melt butter in a pan and cook onions until soft. Cool. Put the sage, walnuts, dried fruit and sausage meat into a bowl with the onion. Season and mix well. Oil a round baking sheet or large ovenproof glass dish. Dust hands with flour and shape stuffing mixture into a long sausage of about 24 inches. Join ends to make a ring. Cover and chill. Make mushroom, chestnut and cranberry stuffing by melting butter and sugar in a pan. Cook onions in same pan until soft. Add vinegar and celery, bring to boil and cook for 1 minute. Cool. Add oregano, cranberries, breadcrumbs, and chestnuts. Season and mix well. Stuff the little button mushrooms with this mixture after removing stalks from mushrooms. Preheat oven to 200°C (180°C fan oven), mark 6. Secure sausages, bacon rolls, mushrooms and orange to sausage ring with cocktail sticks. Add bay leaves, drizzle with olive oil and bake for 45 minutes. 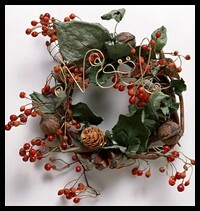 Melt cranberry jelly and brush gently over wreath. Return to oven for a further 10 minutes or until cooked. Garnish with fresh bay leaves for colour. Well, we hope that you have enjoyed reading the fourth issue of our e-zine, as much as we had fun writing it. We also hope that you will stay with us for a long time, visit our web site for updates, and feel free to contribute to the many forums we have created especially for you. Your Gateway to Rural Dreams! Visit us for Country Crafts, Country Decor, Country Cottages, Farm Shops, Farming & Gardening Articles and general issues dealing with Rural & Country Life.